BBC NEWS | Business | Glastonbury: a corporate sell-out? 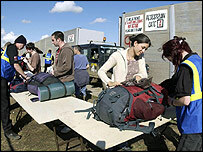 Glastonbury Festival has faced accusations of selling out in recent years. The acts have changed from Marc Bolan and Al Stewart to the likes of Coldplay or Chas n Dave, amidst suggestions that the rock festival is being killed by a corporate culture. Flashing their logos about at the festival are the sponsors Emap, the Guardian Group, Orange and Budweiser, and Natwest bank has secured a foothold with its cash points. Even the policing of the festival, a job once carried out by the Hells Angels, has been handed to Mean Fiddler, the music promoter that recently accepted a takeover bid valuing it at £38m. Festivals have become corporate undertakings, observes Chris Kemp, dean of faculty at Buckinghamshire Chilterns University College. Consequently, both costs and profits can be phenomenal. As the number of festival-goers has risen from 1,500 to 112,000 so have ticket prices - from £1 for the first festival in 1970 to £125 today. With 112,000 tickets sold, this brings ticket earnings to £14m, a sum the organisers say merely covers the cost of the festival. In addition, there are 775 stalls, where stall holders pay in the region of £1,000 for a medium sized pitch, according to sources. This should boost income by a further £750,000 or more. Figures detailing earnings from sponsors are confidential, but experts suggest Glastonbury's total earning capacity could be between £16m and £18m. 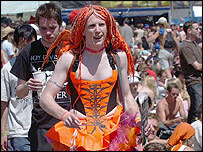 Mean Fiddler took over operational charge of the event in 2002, in return for a stake in the festival that grew each year of the five-year agreement to a maximum of 40%. Its involvement in the festival sparked protests from many quarters, but organiser Michael Eavis has said that without its help the festival would have "died". And Glastonbury has been kind to Mean Fiddler and its staff. Its latest accounts filed in April showed that the festival side of its business was "performing profitably". The company did not give a breakdown of its accounts for each part of its business, but overall net profit for 2004 - when it had a 32% stake in Glastonbury - more than doubled to £2.7m from £1.3m a year earlier. And its return to profit also coincides with its involvement in Glastonbury - it unveiled a huge £8.3m pre-tax loss for 2002. The festival's accounts show that Mean Fiddler managing director Melvin Benn was paid £179,000 in 2003 for providing security at the site, up from £123,805 a year earlier. Mean Fiddler staff were paid a further £79,515. This year, Mean Fiddler's stake in the Glastonbury festival is 39%. Glastonbury's organisers fiercely defend the involvement of companies and majors from the music industry and insists that the alternative - to seek cash from government or local authority grants - would be very tough. "Lots of smaller festivals are sponsored by the Arts Council or local councils," he says, suggesting that while folk, jazz or blues festivals receive assistance, it is unlikely to be available for rock, pop, indie or rhythm and blues festivals. Relying on the income from ticket sales alone is no longer an option, Mr Kemp insists, adding that it has become "very difficult to break even". And yet, the presence of big corporate sponsors seems to sit awkwardly with an organiser that seeks to downplay their involvement. "We don't have anything like the involvement with sponsors that other festivals have," says Glastonbury's director of sponsorship Robert Richards. "We've not increased sponsorship levels for the past four years. "We don't go for overt sponsorship," he adds, adding that arms groups and tobacco companies are all banned, and the sponsors are expected to offer added-value for festival goers. Emap does this by providing the programmes, while the Guardian helps out with the website and Orange provides wap maps of the festival. 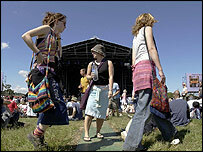 "I seriously believe having dealings with commercial companies does benefit Glastonbury," Mr Richards says. "It's useful. It helps maintain things and allows us to do what we do. "If we had no contact [with companies] we'd be in a little bubble of good intentions of the caring kind, fixed in aspic." So instead of sponsor names and adverts being slapped across the festival, the likes of Greenpeace, Oxfam and Wateraid get pride of place on billboards at the festival. "It gives us a chance to talk to a large number of people, engage them with our campaigns and sign up members," says John Sauven of Greenpeace. "People become more active; thousands have become supporters and signed our petitions." Mr Sauven says Greenpeace enjoys "good branding association" which helps the group reach a younger audience. "It can be difficult to get that age group. Teens and young adults are hard to reach and engage in our appeals," he says. Glastonbury's accounts office insists the festival remains true to its non-corporate ideals and says the festival gives all its profits to charity. Last year, £1.1m was given away to local, national and international charities. "We see the festival as a serious beacon of light in a wicked world," says Mr Richards.